If you want to learn about someplace, you can always pick up a textbook. But if you want to get to know a place, you're going to have to dig a little deeper. And what you find there might be a little strange. The Strange States series will take you on a virtual tour of America to uncover the unusual people, places, things, and events that make this country such a unique place to call home. This week, we head to West Virginia, the home of Star Wars VII co-writer, Lawrence Kasdan, Barney Fife himself, Don Knotts, and Morgan Spurlock, the guy who ate nothing but McDonald’s for 30 days. Nestled in the mountains of southeast West Virginia is White Sulphur Springs, a small town of just over 2000 people. The main attraction in White Sulphur Springs is The Greenbrier, a 157-year-old hotel for the rich and famous, with amenities like five golf courses, a casino, tennis courts, spa treatments—and a secret underground bunker built to provide a safe haven for the Legislative Branch of the U.S. Government in the event of all-out nuclear war. Built between 1958 and 1962, under a covert project codenamed “Greek Island,” the two-story, 153-room, 112,554-square foot reinforced concrete bunker was built into a hillside around 60 feet under the West Virginia Wing of the hotel. While it was never used as a secure location for Congress as intended, it was held at-the-ready until 1992, with 75,000 gallons of water reserves, and over 40,000 gallons of diesel fuel to run three generators that could power the facility if the main electrical grid went down. A large air conditioning unit kept the air contaminant-free and an incinerator would have been used to dispose of garbage and biological waste. As technology advanced in the ensuing years, new equipment was brought in and installed. To keep the bunker at such a ready state, it was staffed 24/7 for 30 years by a team of government employees operating under the guise of TV repairmen for the hotel. In order for the government to continue working after the evacuation of Washington D.C. in the event of nuclear war, the bunker was built with a professional studio for radio and television broadcasts, complete with a variety of background photos that gave the impression the speaker was still in Washington. In addition, the House of Representatives and the Senate each had separate meeting rooms, as well as a large hall for joint assemblies. These conference rooms were hidden in plain sight—they could be booked by hotel guests for special events, under the belief that the rooms were just part of the West Virginia Wing. Little did they know there were secret wall panels that concealed blast doors as large as 18 tons that led to the rest of the compound. To accommodate the 1100 people that could potentially live there, bunk beds were installed in 18 dormitories, and a fully-stocked cafeteria was prepared to make meals for up to 60 days. If more food was needed, thousands of military-grade Meals Ready to Eat (MREs) were stocked along the 430-foot tunnel that led into the facility from the main entrance. Complete medical facilities were on-site, including an operating room, ICU, and an infirmary that could hold 14 people, all manned by a staff of 35. Every one of the four entrances to the bunker was protected by a set of blast doors, including the largest that was 12 feet by 15 feet of steel and concrete, and weighed 28 tons. However, the door was so well-balanced on its 1.5-ton hinges that it could be opened and closed by a single person. Although the bunker remained secret for 30 years, there were whispers of its existence around White Sulphur Springs and among the staff at the hotel. Contractors involved in the construction were suspicious of the 50,000 tons of concrete that were poured at the site, and workers remember the blast doors being installed, but no one could ever confirm just what they were building. 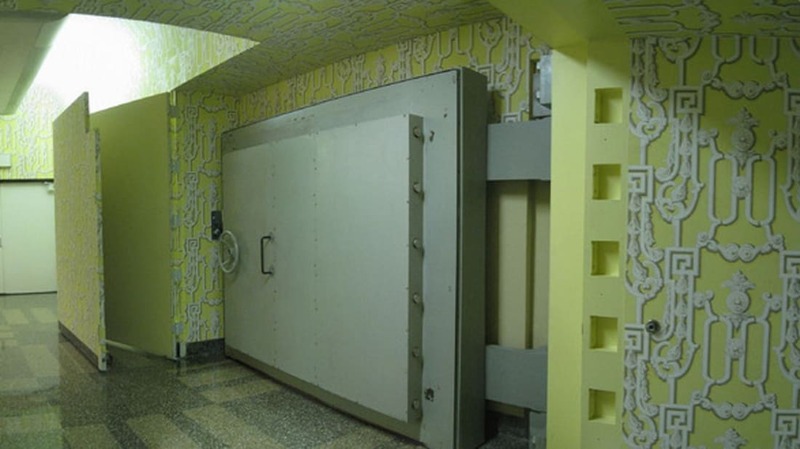 Many told their story, but it wasn’t until May 1992 when reporter Ted Gup of The Washington Post wrote about the Greenbrier Bunker that these stories were given legitimacy. Shortly after Gup’s story was published, the U.S. Government verified the existence of the bunker—then promptly shut it down. By July 1995, the facility had been turned over to the hotel, which now offers daily tours of the bunker for its guests.